Lawrence choirs perform in Lawrence Memorial Chapel. Lawrence University’s choirs, under the direction of Professor Sieck and Professor Swan, performed an impressive and engaging concert on Friday, Feb. 23 at 8:00 p.m. in the Lawrence University Memorial Chapel. The concert also featured the Appleton East High School Easterners Choir conducted by Dan Van Sickle ’03. Each choir conveyed a different theme through the works on their program, and the overall program of the choirs featured mostly female composers. Additionally, each of the choirs’ performances played with space and movement, culminating in an overall nontraditional concert that was very successful. Viking Chorale opened the concert with their program “Nature as Metaphor.” Applause welcomed the choir members to the stage, then confusion settled in among the audience as the choir stood in a circle formation with their backs to the audience. Drones played by senior violist Julia Tibbets and freshman cellist Alyssa Cox began Hildegard of Bingen’s “O Ignis Spiritus Paracliti,” which dates back to the twelfth century. The voices of Viking Chorale rose high in the Chapel and hearkened back to what singing in ancient monasteries and abbeys might have been like. After performing two more pieces on their own, Viking Chorale collaborated with Concert Choir for “Lumen” by Abbie Betinis, only their collaboration didn’t start with both groups on the stage. Instead, Sieck held out a drum and began beating it while Viking Chorale responded by simultaneously singing and exiting the stage. Meanwhile, Concert Choir rose from their seats in the Chapel and sang as they moved towards the stage. Both ensembles managed to stay together with the beat of Sieck’s drum while singing beautifully. This transition from Viking Chorale to Concert Choir was so smooth that it precluded the audience’s applause. Concert Choir’s program was fittingly titled “Collaborations,” as it included works that required individuals in the choir to sing autonomously at times while keeping together with the rest of the ensemble. Their first piece, “Spem in Alium” by Thomas Tallis, exemplified this idea immediately. The piece started out small, with only a few solo voices, and other members of the ensemble gradually joined in. The result was gorgeous, blossoming polyphony with a plethora of moving parts mingling in the group sound. The program notes informed the audience that this piece had 40 separate parts—a fact which only served to heighten the feat of the excellent performance achieved by Concert Choir. The next piece that Concert Choir performed was “Épithète moussue” by junior Christian Messier. The text for the piece comes from a poem at the end of Victor Hugo’s “Les Misèrables,” which captions the death of the character Jean Valjean. Whispered words spoken over muted whistling began the work, which eventually morphed into soft singing. Performed acapella, the piece sounded like a perfect soundtrack to the final translated line of the poem: “As night falls when day fades away.” This thoughtful piece was a well-performed, resounding hit. Concert choir performed several small chamber works featuring different members of the choir. Some pieces, like Liza Lehmann’s “Trial Scene” from “Nonsense Songs from ‘Alice in Wonderland’” involved acting in conjunction with singing. They also sang a chamber piece by Associate Professor of Music Asha Srinivasan titled “The Poet’s Dream,” which used drones and whispered lines of poetry. Then the Appleton East High School Easterners performed one piece by themselves and one piece with the Concert Choir. For the latter piece, “Let My Love Be Heard” by Jake Runestad, the groups combined onstage so that members of both choirs were intermixed, and the wonderful volume of sound they produced rang in the audience’s ears. Cantala’s portion of the program, titled “Awe and Wonder (Hope, Strength, and Joy),” finished the Winter Choir Concert. Their first pieces on the program featured a string quartet comprised of junior violinist Abigail Keefe, senior violinist Rachael Teller, senior violist Nat Sattler, and senior cellist David Sieracki. The quartet’s warm harmonics blended well with Cantala’s voices. 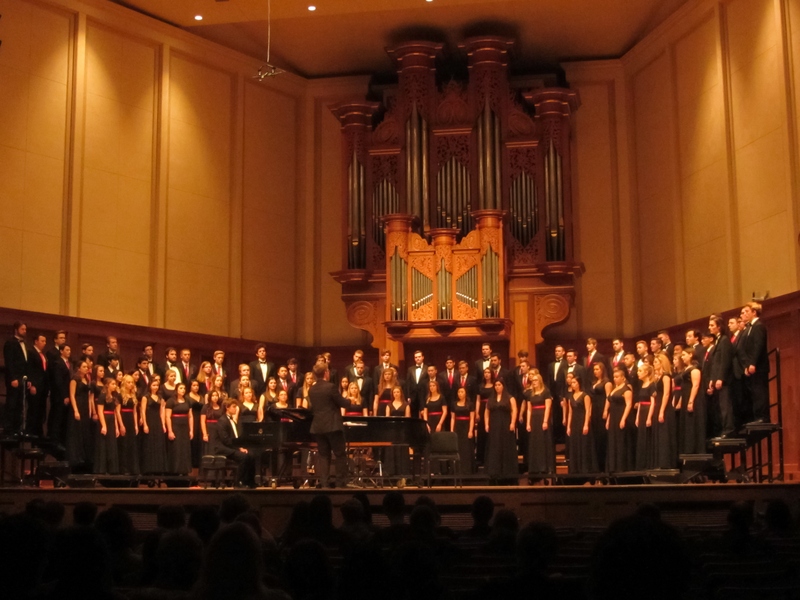 Before their last few pieces, Professor Swan informed the audience that Cantala had been selected by blind audition to perform these pieces at the American Choral Directors Association’s conference in Chicago, IL over midterm reading period. This accomplishment seemed fitting for Cantala’s excellent singing and musicianship. Moreover, the choir members especially seemed to enjoy themselves onstage, moving with the music and even stomping and jumping for their final piece, “Ta Na Solbici (And So We Dance in Resia)” by Samo Vovk. The Winter Choir concert showcased the hard work of many individuals. The program connected with the audience, who seemed to enjoy the program immensely, judging by their loud applause and cheers at its conclusion. Overall, this contemplative concert pushed boundaries while still exhibiting fine music. For more information on any of the choirs and their upcoming performances, please visit the Lawrence University website.